Sherrilyn Kenyon (also writing as Kinley MacGregor) is the #1 New York Times bestselling author of the Dark-Hunter series. She’s also written a few other series, including the Bureau of American Defense (or BAD for short) and the League series. In all, she’s got over 20 million books in print in over 30 countries. She’s received quite a few awards, including the Holt Medallion, Sapphire Award, Romantic Times Reviewer’s Choice Award, The Golden Quill, and several Prism, Laurel Wreath, PEARL, and Golden Rose Reader Choice Awards. Matthew Peterson: Hello there. This is Matthew Peterson, the host of The Author Hour, which can be found at www.TheAuthorHour.com. Last week I had Esther Friesner and the Best of the Bonus questions. The week before that I had a vampire episode with P. C. and Kristin Cast, Charlaine Harris, Laurell K. Hamilton, and L. J. Smith. This week’s theme is Urban Fantasy and Supernatural Characters with Sherrilyn Kenyon, Patricia Briggs, Kelley Armstrong, and Charles de Lint. My first guest is Sherrilyn Kenyon, #1 New York Times bestselling author of the Dark-Hunter series. She’s also written a few other series, including the Bureau of American Defense (or BAD for short) and the League series. In all, she’s got over 20 million books in print in over 30 countries. I’m not going to name all of them, but she’s received quite a few awards, including the Holt Medallion, Sapphire Award, Romantic Times Reviewer’s Choice Award, The Golden Quill, and several Prism, Laurel Wreath, PEARL, and Golden Rose Reader Choice Awards. That’s a lot of awards, Sherrilyn. Sherrilyn Kenyon: [laughs] Thank you. Matthew Peterson: Thanks for being on the show today. Sherrilyn Kenyon: Oh, my pleasure. Thanks for letting me come out and play for a little bit. Matthew Peterson: Yeah, yeah, get out of your cave a little bit and get to have some fun. [laughs] Now I heard that you had some hurdles to jump at the beginning of your writing career. You’ve struggled with dyslexia . . .
Matthew Peterson: . . . a partially paralyzed hand, which made it difficult to type. Sherrilyn Kenyon: People say that, but I really don’t ever think about it. People focus on it, but I don’t. The only time it bothers me is when I’m trying to play the flute. Matthew Peterson: Oh, yeah, I can imagine that. I actually have a little bit of dyslexia as well. Matthew Peterson: I know! My wife thinks I’m joking. I’m like, “No, I’m not joking, I really am.” I mean, I’ll switch numbers, and I’ll switch first and last names around. [laughs] Or I’ll merge them. Sherrilyn Kenyon: It’s terrible isn’t it? Compound words are my nightmare. Matthew Peterson: Yeah, yeah, and when I get people editing my work, my books, number one thing I ask them is, I say, “Look for things that I’ve switched.” ‘Cause I will switch things around constantly. “Please make sure you look for that.” I’ll switch letters around in the words, and it’ll still be a correctly spelled word but totally different. Matthew Peterson: So, what helped you to overcome those trials? Sherrilyn Kenyon: Southern celt. Over, under, around or through, there’s always a way. I’m just stubborn from birth. Matthew Peterson: Stubborn, huh? Yeah, I used to live in the South for a little bit. I saw that a little bit in the South. Sherrilyn Kenyon: Oh yeah. Yes. Matthew Peterson: Like eight boys? Is that right? Sherrilyn Kenyon: Yeah, well, two are my brothers; six are cousins. Matthew Peterson: Six are cousins, okay. Sherrilyn Kenyon: No, it’s like, “Don’t you have a home? Can’t you leave?” But we adopted, so they lived with us. Matthew Peterson: I feel for you. I have one sister, and she has seven brothers. So I know she probably feels the same way you did, just being around with all these boys. Matthew Peterson: Did that influence your writing in any way? Having so much masculinity all over the place growing up? Sherrilyn Kenyon: I think it allows me to understand male thought processing. I’m not sure how much I understand females, but I definitely have a lot of insights into the male psyche that I wouldn’t have. Because I didn’t realize I was a girl until I was about seven years old. Matthew Peterson: That’s funny. Well, you’ve come a long way since your first novel. Your first novel in the League series was Born of the Night. And it’s been many years since then. You’ve got two new books. Matthew Peterson: Yep, yeah. You’ve got two new ones in that series, Born of Fire and Born of Ice, that have just come out. How do these two new books tie in to the League series? Sherrilyn Kenyon: They actually were all published at the same time. Well, Born of Fire is a little different, it was one of the first ebooks that was ever produced, back in like ‘96, I think. Sherrilyn Kenyon: I was the first New York published author that did an ebook and that was it. Born of Ice was actually originally done as Paradise City, so they’re re-issues. Sherrilyn Kenyon: But I’ve gone in and totally re-written them. So all three of them are like brand new books. Matthew Peterson: And they’re futuristic? Science Fiction? Sherrilyn Kenyon: Mm hmm. Science fiction. Matthew Peterson: Okay. What can you tell us about those books? Sherrilyn Kenyon: It’s in a separate universe. Everything’s set in the Ichidian Universe. One of the things that I was fascinated with, because my father was a drill sergeant, was a lot of military and ‘cause there was a song years ago, Lords of the New Church--again, I’m not that old, but if I were--called Open Your Eyes, where it’s talking about assassination politics. And the world is kind of that. It’s all based around assassination politics and what if assassins ruled day-to-day lives. Matthew Peterson: Interesting. And there is romance, and there’s, I mean, there’s definitely love stories in these books as well. Sherrilyn Kenyon: Yeah, well, all the books are about relationships between friends, parents, children and of course male and females. ‘Cause that is the human dynamic we all have. Matthew Peterson: Yeah. Now, your Dark Hunter series. . . I mean you are a fast writer, I have to tell you. You’ve got like 26 books in that series. This one is not quite the science fiction; it’s more of the urban fantasy, supernatural. Matthew Peterson: What got you started in wanting to write urban fantasy or supernatural? Sherrilyn Kenyon: It’s all I ever wrote. The first book I ever did was when I was seven years old. And it was about a girl who has psychic abilities who killed her brothers. Sherrilyn Kenyon: It’s just all I’ve ever written. You know, the first stuff I started doing were all vampire novels. My mother was a huge horror fan and she took me to, I think I was 3 or 4 years old, she took me to see Night of the Living Dead at a drive-in. Matthew Peterson: Yeah, I know, I remember hearing about that. People were fainting in the theater watching that movie. Sherrilyn Kenyon: I know, but I thought it was one of the neatest movies. I kept wanting to go back. Instead, I had to make my brother take me like three-four times. Matthew Peterson: Oh wow! Yeah. Matthew Peterson: So, you really liked some of this darkness–a little bit of horror, fantasy, vampires. Your first book in the series. . . you know, you’d already published several other books, why did it take so long to get this first one published in the Dark Hunter series? Matthew Peterson: Yeah, yeah. And your last one that’s available, Bad Moon Rising, that was the 26th book in that series, and like you said, you’re not very old, but you just write really fast, and you just keep pumping these out. Tell us a little bit about Bad Moon Rising. Sherrilyn Kenyon: That one’s more of a Romeo and Juliet story. Fang and Amy have had a relationship since the second book, and they’ve kind of been tap dancing around each other because he’s a wolf and she’s a bear and they’re not supposed to be together, any shape, form, or fashion and yet, you know, it’s a very complicated relationship. Matthew Peterson: [laughs] Yep, bears and wolves! That’s very fun. And you actually have a graphic novel, too, don’t you? Sherrilyn Kenyon: I do. Marvel did the Lords of Avalon, which my Arthurian fantasy series. And then we have the Manga for the Dark Hunters. Matthew Peterson: Awesome! So, what was it like going from full length books to moving over to that medium of graphic novels and Manga? Sherrilyn Kenyon: The Dark Hunters actually started out as graphic novels. I tried years ago to get D.C., Marvel, and Dark Horse interested in them back in the late ‘80s. [laughs] I went to college originally wanting to get into art and it did not manifest, unfortunately. Art school’s really expensive and I had to go find something else. But that had been my intention all along. It was actually really wonderful to be able to finally get to that medium, ‘cause, you know, going back, I learned to read on comic books. But for Spiderman, I’d probably be illiterate today. Matthew Peterson: I know at least in the U.S., they’re a fairly new concept. . . of graphic novels and Manga, and they’re all the rage right now. Matthew Peterson: Yeah. They’re a lot more common now, so that’s exciting. Matthew Peterson: Another thing I wanted to ask you about. . . now, you’ve written a lot of books as Sherrilyn Kenyon. And you also have a lot books written as Kinley MacGregor. What was the reason of getting a pseudo name and writing as Kinley MacGregor? Sherrilyn Kenyon: Well, when the Kenyon career tanked . . . [laughs] it was after the original League books came out and I did non-fiction books. I had a four and half year involuntary hiatus where I literally could not sell Alpo to a dog kennel. Sherrilyn Kenyon: When my editor came back and finally bought me again--thank you, Laura--she asked if I would consider a pseudonym. One of the reasons, the stuff that I had been doing had been paranormal and science fiction, and at that time, you know, this is ‘98, nobody would touch it. I mean the markets were totally dead--nobody, with the exception of Anne Rice. There was nobody listing anywhere with it. And she’s like, “Well, we want to get you away from all that and start you over fresh, so would you consider a pseudonym? And so we started Kinley MacGregor. Matthew Peterson: Oh, okay. And as that name, you’ve done Lords of Avalon, Brotherhood of the Sword, MacAllisters, Sea Wolves, and these books are just as popular. Maybe a slightly different audience who like the history and not quite the same as the supernatural, but you also have another book coming out, Darkness Within? In the Lords of Avalon? Sherrilyn Kenyon: I think that will be out in March. Matthew Peterson: What other projects do you have in mind for the future? Sherrilyn Kenyon: We’ve got both Nevermore and Infinity, which are young adults that are coming out. Infinity is a Dark Hunter spin-off. There’s a character in there, Nick, who’s now a dark hunter; he started out as a squire. The series name’s actually Chronicles of Nick. Matthew Peterson: Okay. And did I hear you say these will be young adult? Matthew Peterson: Young adult, okay. Sherrilyn Kenyon: In the case of Nick, they’ll be aging with him. The first one starts when he’s 14, so it’ll go up until he’s 24. Sherrilyn Kenyon: So, the age on those will actually increase every year. Matthew Peterson: Well, I’ll keep my eyes out for them. Well, Sherrilyn, it’s time for a commercial break. 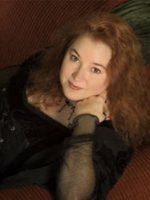 I’ve been speaking with Sherrilyn Kenyon, #1 New York Times bestselling author of the Dark-Hunter and the League series. Thanks for being on the show today, Sherrilyn. Sherrilyn Kenyon: Oh, thank you so much. Matthew Peterson: Alright, go to www.TheAuthorHour.com to listen to Sherrilyn’s bonus question. Don’t go away, I’ve still got Patricia Briggs, Kelley Armstrong, and Charles de Lint.